Fuchs’ endothelial dystrophy, or Fuchs’ corneal dystrophy, sometimes called Corneal Endothelial Dystrophy, is the most common primary disease of the corneal endothelium. It is caused by a gradual degeneration of the endothelial cells and can produce significant visual disturbances. A Comprehensive Eye Exam is needed to detect corneal endothelial dystrophy. During the exam, a slit lamp will be used to perform a detailed examination of the cornea. During this procedure, we will examine the cornea under high magnification to look for subtle changes in the appearance of cells in the endothelium that are characteristic of the disease. The early signs of corneal endothelial dystrophy are a reduced number of endothelial cells and tiny lesions in the corneal endothelium called corneal guttata. Another test we might perform is a measurement of your corneal thickness (pachymetry), to detect any thickening of the cornea that might indicate corneal swelling from the disease. Visual acuity testing with a Snell eye chart can reveal diminished vision due to corneal swelling. 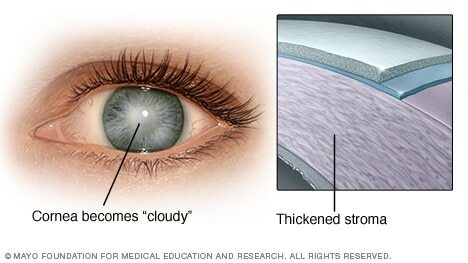 If either of your parents have corneal endothelial dystrophy, you have about a 50% chance of developing the disease.